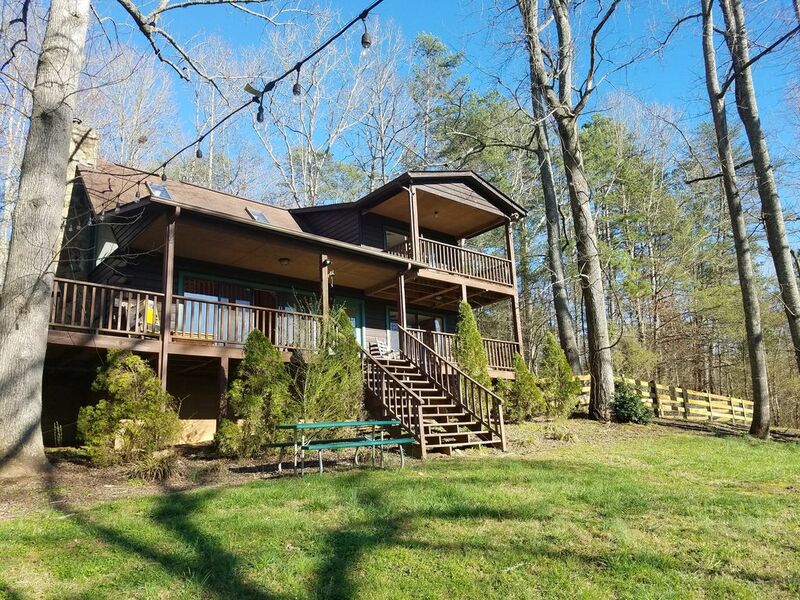 Perfect for the family vacation or a romantic getaway for two, this secluded cedar log cabin is nestled in a picturesque valley among three wooded acres on the banks of the Nottely River, just outside of Murphy, North Carolina. The Great Smoky Mountains surround the area and provide spectacular views, as well as an abundance of outdoor activities. Enjoy beautiful sunsets over the mountains from rocking chairs on the wrap-around porch or reading by the magnificent riverstone fireplace. As evening nears, drift off to the sound of whip-o-wills in the distance and the glow of fireflies illuminating the sky. In the mornings, awaken to the melody of geese circling the nearby lakes. Newly renovated, the cabin offers spacious vaulted family and dining rooms, a sleeping loft, four bedrooms and two bathrooms, and is comfortably furnished. The wrap around deck offers great views of the spacious yard and the river. We purchased this cabin as a place for our family. We are looking forward to years of memories and adventures. The cabin is on 3.5 acres, on the river, and is perfect for families with children and multiple people that are looking for a big area to play and have a camp fire. Lower level has a full bathroom with a washer and dryer. The upper level has a full bathroom. There is a fenced in dog run off of the main deck.